The most brilliant creations of the artisans of 19th-century Central Asia were the ikat silks, which were often made into robes and were also used as wall hangings. Even though these creations resulted from a long tradition of textile production, unique pieces showed amazing creativity. 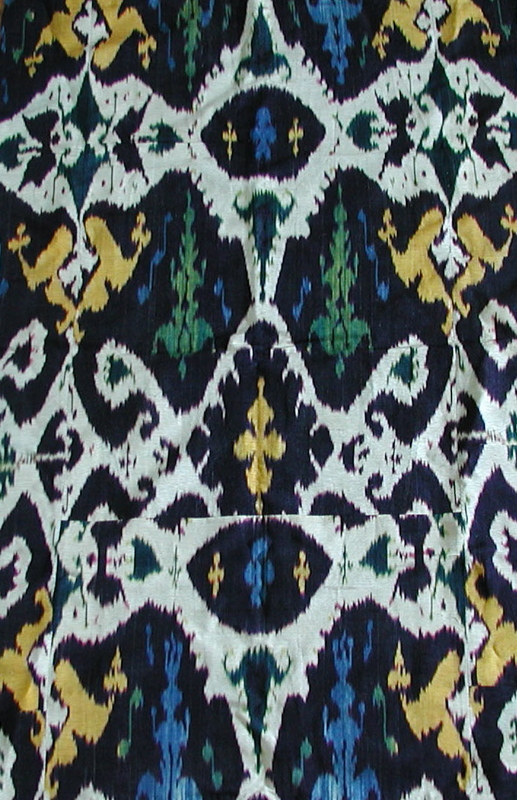 The most important period of ikat creation was between the years of approximately 1800 to 1880. Subsequently ikat was still woven, but the art became more of a craft with commercial value. The ikat weaving process in Central Asia began primarily in the oases cities; those cities were actually like little kingdoms and each was ruled by an Emir, Khan or local lord. The most amazing ikats came from the city of Bukhara (now in Uzbekistan) because that city had the best economy, the most trade and the most surplus wealth. It appears that ikat weaving began in Bukhara, and there were more than fifty neighborhoods there involved in different kinds of textile production. Although most textile production in Central Asia was done by women or nomads, the weaving of ikats was completely different. Urban men produced the ikats, and each of the stages was performed by specialized craftsmen. Women did, however raise the mulberry worms and process the silk to sell in the bazaars. Dyeing was a secret art and was highly specialized. Jewish men controlled the distribution and trade of the indigo dye and thus had a virtual monopoly on indigo dyeing. Uzbek weavers did most of the ikat weaving on cotton wefts (“adras”), and Tajik weavers wove most of the silk ikats. Ikat is an ancient technique, a method of wrapping yarns to form areas of resist, and then dyeing those sections of yarn before the weaving of a cloth begins. Traditional Uzbek ikats were symbols of status, wealth, power and prestige. In the oasis towns of Central Asia, a passer-by could guess the rank and status of a man or woman by judging the clothes he wore. Even the poorest member of society might find a few torn pieces of ikat for his outfit, which you can sometimes see in old photographs of dervishes. In addition to the old pieces, in our store we now have new ikat from Uzbekistan, woven with silk and vegetable dyes. Some of our new ikat is made into cushions.